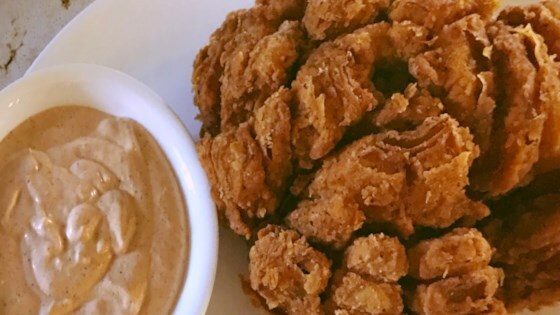 "This batter-fried onion and a spicy dipping sauce will get your party going any day!" Pretty good in the end. But difficult and tricky to complete. Good luck! great recipe! for everyone having problems with the batter not sticking i recomend after dredging in batter allow it to sit for a while, 10min. Also beautiful presentation!! We loved this! I used the batter mixture to make onion rings instead of the blooming onion and then we dipped the rings in the sauce. It was a hit!! !